Friday March 8, 2019, 10-2 p.m. This will be a limited drop-off opportunity. We may have to close early if our collection unit fills up. Latex paint will only be accepted for a small fee. Household hazardous waste is a small percentage of every islander’s total waste, yet its proper disposal makes the greatest immediate impact on our air, water, and soil quality. When you take a little extra time to identify and separate hazardous items, or use alternatives, you make big strides toward our goal of a zero waste community. It can be difficult to determine. Products are hazardous in different ways based on their specific danger. A product, like pesticide, is “toxic” because it causes illness. “Flammable” means the product burns easily, like paint thinner. Waste that is “corrosive,” like oven cleaner, eats through other materials. A hazardous item like fireworks might also be “reactive,” because it causes a dangerous reaction when exposed to heat, air, or water. When in doubt, look for labels that emphasize these words: combustible, warning, caution, danger, harmful is swallowed, and keep out of reach of children and pets. Do quick audit of your home. Separate them from your garbage and comingled recycling cans. Every item above that has a link associated with it is recyclable at The Exchange. Others link to ideas for natural alternatives. Everything else can be dropped off at the Hazardous Waste Pick up days, which are sponsored by San Juan County. If you still can’t figure out what to do, contact us. What to do we NOT accept? 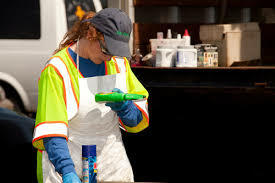 We only accept hazardous materials from businesses during our annual June pick-up event. Similarly, we only accept gasoline in June. Also, we NEVER accept latex paint during round-ups; but now we have a recycling program for latex, you can read about it here. Did you know you can remove rust with sour milk? Or adding one cup of vinegar and ¼ cup of baking soda to the final rinse of your laundry is a fabric softener? Stop buying household products containing hazardous materials. Commit to finding alternatives instead. If it is too intimidating to imagine revamping your entire house in one audit, try one room per month until your entire house is hazmat-free within the year. It is the best thing you can do for the environment on Orcas Island. Do you have your own non-toxic secret recipe? Share it on our Facebook page.